MEMPHIS, Tenn. (AP) In a pivotal moment, a rookie got the best of a veteran, stemming a late rally by the New York Knicks. Courtney Lee got a technical foul while jawing with Memphis rookie Dillon Brooks, setting up three pivotal free throws by Tyreke Evans in the Grizzlies’ 105-99 win Wednesday night. The Knicks, who had trailed by 18 in the third quarter, were within 102-99 when the teams set up for a jump ball with 17.8 seconds remaining. That’s when Lee and Brooks began talking smack. After a warning from official Derrick Stafford, Lee was called for a technical. That led to a free throw by Evans to extend Memphis’ lead. Two more free throws from Evans, who finished with 23 points and 10 assists, provided the final margin. The technical foul thwarted a fourth-quarter rally that came close to erasing a Memphis lead that was still at double figures with six minutes left. Three-pointers from Lee and Tim Hardaway Jr. made a significant dent in the Grizzlies advantage. Lee’s 3-pointer with 48.5 seconds left set the stage for the stretch. Memphis had shot well and dominated throughout the first three quarters, still shooting 51 percent while carrying an 88-73 lead into the fourth. All that despite missing Marc Gasol due to illness. 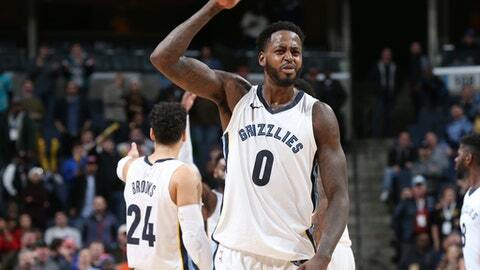 JaMychal Green added 18 points and 13 rebounds, while Brooks and Jarell Martin added 17 points each to help Memphis win its second straight. Kristaps Porzingis led the Knicks with 21 points, while Enes Kanter finished with 20, including 18 in the first half. Lee and Michael Beasley had 18 points each. Besides Gasol, Memphis continued to be without starting point guard Mike Conley and forward Chandler Parsons, both dealing with long-term injuries. Knicks: Have lost seven straight road games in Memphis. New York’s last road win against the Grizzlies was in March 2011. … Lee converted a free throw with 5:05 left in the second quarter – his 45th straight, setting a franchise record. Chris Duhon held the record of 44, set during the 2008-09 season. Lee now has 48 straight. … Television analyst and former Knicks star Walt Frazier took a ball to the face in the first half. He never missed a play and returned after treatment at halftime. Grizzlies: Memphis also was without F/C Brandan Wright due to illness. … With Gasol out, Deyonta Davis started the first game of his career. … The Grizzlies, who beat the Lakers on Monday, had not won consecutive games since Oct. 26-28. Knicks: Continue seven-game trip at Utah on Friday night. Grizzlies: Host Sacramento on Friday night.